I am so proud to announce that my latest project is available for you! I have been hard at work most of this year putting it together - it was really fun to focus on just two songs, and two very special songs at that. First things first, here’s all the links to where you can stream or buy the digital tracks or physical vinyl. Also you can go buy a copy at Sonic Boom Records if you live in Seattle! Why these songs? Why a vinyl? 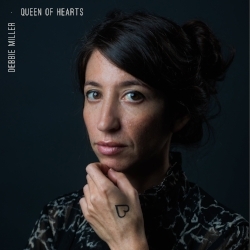 Queen of Hearts and Persepolis Song are both songs that I wrote for the Bushwick Book Club Seattle, and so both inspired by novels (Alice in Wonderland by Lewis Carroll and Persepolis by Marjane Satrapi) rather than my own personal life - even though there are emotional themes in the songs I really connect to. So in a sense, to me they are stand alone tracks that might not fit so well on an album of mine. They are also the two songs that people have asked to purchase the most after a show. I thought they deserved their own little special vehicle and what is more special than vinyl? I wanted to give them the royal treatment. I finally decided to record them after I got approached by PBS to be a part of their documentary series The Great American Read so they might incorporate Queen of Hearts into an episode. It gave me the push I needed to finally do it. This two song project was a big communal effort and out of it came so much beauty. I got the opportunity to record at Studio Litho (uh, hello Pearl Jam) and work with people in the Seattle music community at the top of their craft. Moe Provencher (host of the new podcast Grief Relief) was my sound engineer, co-producer, and backbone. Michael Thomas Connolly of Empty Sea Studios (remember my album LIVE in an Empty Sea? Yeah, that guy.) recorded most of the backing track for QoH. Alex Guy (Led to Sea, Laura Veirs, Sera Cahoone) created a beautiful string arrangement for Persepolis Song. I was honored to have Ed Brooks of Resonant Mastering to master the tracks. From the artwork to every last note and edit there was intention behind every little detail. I am so happy with how it came out, and I hope you enjoy it! The title isn’t really all that creative, to be honest. But I felt it appropriate. This record shows the two sides of my song writing - funny and sad. It shows the two main sides of my musicality - piano and guitar. Plus a vinyl literally has two sides. Also, I love explaining things that are obvious. Just in case. I was pretty excited to get these, know I’m smiling behind the record. PBS re-watch + Queen of Hearts single out now! Oh heeeyyyyyy Meredith Vieira said my name on national TV. I was on an episode of PBS’ The Great American Read, and they featured me alongside my song, Queen of Hearts, which was inspired by Alice in Wonderland. I wrote the song back in 2012 for my first show with the Bushwick Book Club Seattle. The song stuck, and I was pretty tickled when the producers of the show contacted me to be a part of the series. Scroll to minute 41:00 to watch the entire segment - or better yet, watch the full episode to see actual celebs talk about their fave books including Neil Degrasse Tyson, Cynthia Nixon, Allison Williams, George R.R. Martin, and Chelsea Clinton. Also, we decided to finally record the track in the studio - now available everywhere you like to hear music! Back in 2012 I wrote a song called 'Queen of Hearts' inspired by Alice in Wonderland for my first show with the The Bushwick Book Club in Seattle (musicians write songs inspired by books and perform them in front of an audience, its way rad). Producers from PBS' 'The Great American Read' (um, hosted by MEREDITH VIEIRA) found the song online and loved it so much they reached out to see if I would be interested in being interviewed about it for the series. And so that's what happened, and now I'm gonna be famous. (Kidding about that last part.) Seriously though, it was such a fun experience and I am pretty tickled about it. Tune in to your local PBS channel Tuesday October 2nd @ 8pm to see a familiar face on your TV screen! In related news, I figured I should probably record the ‘Queen of Hearts’ already since it's long been a crowd favorite. A digital download will be available on 10/1, and it will be on a 7" vinyl I am putting out in November. More on that soon! In the meantime, check out the original performance in my videos section. If you see a show in your area, RSVP to bookings@thedebbiemiller.com. I'll hook it up. These are all house concerts (except for the show in Morro Bay - that one is open to the public!) - MY FAVORITE. Some of these are return shows, some are brand new. I am so excited to see old friends and new friends, get some SUN (thanks Seattle...), and sing my lil' heart out. I am privileged to be able to tour this way, and it is all thanks to people like you who support my art and are willing to open their homes to me. Here is a new song, written and recorded for the Bushwick Book Club (Seattle). It is inspired by writer Ruby Hansen Murray's gorgeous piece "Osage Sister" from the Jack Straw 2016 Writer's Anthology. It's different from most things I write (hello, a cappella!) and I hope you like. Where do I even start to sum up this tour? With all of the tragic world events as of late, it feels selfish to even share my experience, because what does it really matter? I toured, I played my music, I drove A LOT. But, it was incredible, and during this tour - much like my last one - I was awash with gratitude and awe at the beauty and connectedness of humanity, and so it feels worth writing about. It gives this somewhat neurotic cynic some faith, and I hope to live by the example of the boundless generosity I encountered on my adventure. From east to west, and north to south, I reconnected with countless people who have meant the world to me. I made new friends and fans in places I never thought I’d visit. I saw incredible sites I didn’t even realize were on my path. From Savannah to Maine, from Idaho to New York and back again, I sang my heart out, and I hope it meant something to some people who were game enough to come to a show. Some of the spaces. Clockwise: New Lenox, IL; Portland, ME; Bellmore, NY (aka my parents' house! ), Dr. Lulu's Naturopathic Clinic in Asheville, NC; Salt Lake Elevated in Salt Lake City, UT. My hosts were unbelievably welcoming and generous, and the audiences were so attentive and engaged. I played in houses, apartments, a garden, a medical office, a fitness club, a nudist resort, at an engagement party, and a house-warming party. Thank you so much to the people who opened up their homes and lives to me - words don't do a great job of expressing just how lucky and grateful I feel. It's the details that slay me. Top: My name in a Lite Brite and on a girl-power white board in Downers Grove, IL. Middle: The welcoming room and a specially prepared cocktail called "The Debbie Miller" in Stonington, CT. Bottom: Music pop-up books placed in my room in Oneonta NY, and my name on the cutest chalkboard that ever was in New Lenox, IL. My mini-cooler is amazing, and I got to eat something green every once in a while. I got it for free while temping in NYC for a fancy real estate company years ago. Thanks, Vornado. Turn your front passenger seat into a makeshift kitchen. What else is it there for? Dr. Bronner’s really is magic soap, and I used it for EVERYTHING. It’s always important to have chips in the car. It’s always important to have more chips in the car, for when you run out of your first bag of chips. PODCASTS, especially Stuff You Should Know. Now, I know more stuff. For when you are falling asleep at the wheel, a good phone call home to mom and dad (of Kickstarter video fame, fast-forward to minute 1:18) does the trick. New Yorkers talk loud and fast! Add at least 1.5 hours to your anticipated driving time. Nature calls. A lot. Especially if you are trying to stay hydrated and/or caffeinated. When a Motel 6 in Wall, South Dakota is your biggest tour splurge, you know you’ve done a decent job of being frugal. Adele’s 21 or anything from Glee are a must for when you (well maybe not you, but me) need to belt something at the top of your lungs. Because you are by yourself, so let it out baby. Also, I got to see the country. Clockwise: Badlands National Park, SD in a thunderstorm; Badlands National Park in the sun; Veterans Healing Farm in Hendersonville, NC; Sioux Falls, SD. 'LIVE In An Empty Sea' is out! I am so excited to be writing these words - my newest album 'Live In An Empty Sea', which was community-funded through Kickstarter is finally available on all of your favorite music services. The album was recorded live in front of an audience on 3.14.15 at Seattle's Empty Sea Studios. I hope you enjoy it! Copies of 'LIVE In An Empty Sea' are making their way to kickstarter supporters from across the globe. Are you one of them? CLICK HERE for more info! I am so thankful and grateful for all of the support I received in making this live album. What a tour - and NEW album out in 2016! My first tour was incredible on so many levels. I got to share my songs with so many new people all up and down the west coast, see so many beautiful places, and make a lot of new friends. It has long been a dream of mine to be able to do something like this, so CHECK! I also had a scary experience that really shook me up, which in the end I was thankful for. Because who doesn’t need a good dose of perspective every now and then? Infinite thank you’s to all of my house concert hosts, and the countless people who helped me put this thing together. CANNOT WAIT TO DO IT AGAIN, ALL CAPS. In other news, my new album LIVE In An Empty Sea, which was recorded live in front of an audience this past spring will FINALLY be ready for your ears in early 2016! Woot! I’ve always thought gratitude was a hokey word and I don’t use it much. But I get it now. At every show I have played on this tour, I have encountered incredible kindnesses and generosity in ways I didn’t even know were possible. The fact that anyone is willing to open up their home to me so I can play some songs in it is surreal. And don’t even get me started on the fact that there are people there to listen - I can’t even. So, gratitude. I was literally thinking these very thoughts just before I lost control of my car last night on Highway 101. I was following my dear friend, Kate Graves, back to her house after our show at the Santa Barbara Guitar Bar. It was extremely windy, and it had rained earlier on for the first time in months. Out of nowhere, Kate swerved suddenly to the left, revealing a massive tree in the middle of the freeway. Which I was now barreling towards at 60 mph. I slammed on my brakes and swerved left too, only my car stopped obeying my steering wheel. I skidded back and forth over 3 lanes of traffic for what seemed like forever, and then careened to the right shoulder while my car rotated 180 degrees. I braced myself for an impact. And then - nothing. My car screeched to a stop about a foot from the freeway barrier and shrubs, completely within the shoulder. Mind you, I was now facing the wrong way - but I (and my car, Badonkadonk) was unscathed. Thank G-d that Kate was also unharmed. I could smell the burnt rubber from my tires. Two other cars were pulled over due to an accident caused by the same fallen tree, and the cops were already on the way. So I was eventually able to get safely turned around (I might one day write an ode to flares) and go on my way. I 100% ugly-cried to the police officer who helped me in a moment of shock and catharsis. Poor guy. I’m not telling this story to sound dramatic or get pity. I am sharing it because it was miraculous, and I’m emotional about it. It was a miracle that when my car was skating all over 101, no one hit me. It was a miracle that when my car was doing a 180, no one hit me. It was a miracle that when I was headed straight for the barrier, I didn’t hit IT. It felt like falling off a building, but never hitting the ground. Maybe it was just luck and chance that saved me, but it felt more divine than that. I had the sensation that something or some force protected me in those moments. Then again, maybe thats how everyone feels after a near-death experience, so what do I know. And so, gratitude. Gratitude for being alive. Gratitude for miracles, friends to cry to, places to sleep, meals offered, and connectedness. Gratitude for the reminder that life is porcelain, and how anything is subject to change within the blink of an eye. If you want to follow my tour-ventures, check out my new Tumblr page! I’ll be updating it often! This song is my own twist of a sappy love duet when someone does something wrong, and both people are sorry. For example, this song performed by Kid Rock and Sheryl Crow. I got a little writing help from my buddy Dave Beck back in my New York days. The full song will be on the album. Promise. LIVE ALBUM = RECORDED. I can’t believe it’s over! The whole night at Empty Sea Studios was amazing, and I really can’t put it into words. I couldn’t have done it with out the support of my friends, family, and fans. A big huge thank you to the incredible lineup of musicians who added their myriad talents to the performance (Gabriel Wolfchild Julia Massey, Amanda Sue Winterhalter Mya Byrne, Grace Yoo, Matt Hart, Greg Coladarci, and Aimee Zoe). We laughed, we cried, we laughed some more, I did a few Debbie-Do-Overs. The album won’t be out for a bit, but keep checking back for videos and other fun stuff. For now, here’s a few photos from the night.